The Drill Hall building was originally part of the North Ward Defence Complex, development of which began in 1885, constructed as a Volunteer Defence Training facility. It was not until the discovery of gold in the 1850s that the need for a strong military presence in Australia was seen to be necessary. Gold shipments required protection within the country and shipments at sea needed protection from privateers. In 1904 the Queensland Government Architect, Alfred Brady approved drawings for a new Drill Hall and Administrative Offices. The drawings indicate that the existing Staff Quarters, Stores, Office Building, Stables and Small Shed were to be retained, but the original Drill Hall was to be removed. The new Drill Hall was completed in 1905-06. Aside from minor changes in 1908, the Building has remained largely unchanged since. The building’s significance comes from more than a century of continuous Military occupation, and its role in recruitment for WWI. 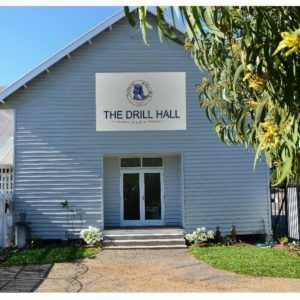 There are only two Colonial era Drill Halls remaining in Queensland now – the other being in Rockhampton. The Drill Hall was the home of the Kennedy Regiment, and later the 9th Field Ambulance. It is sobering to think that of over 500 soldiers who enlisted for WWI and trained at The Drill Hall, 172 did not return. If only these walls could talk, the tales they could tell.